Global Business Elite Go Marxist at Davos! Not really. 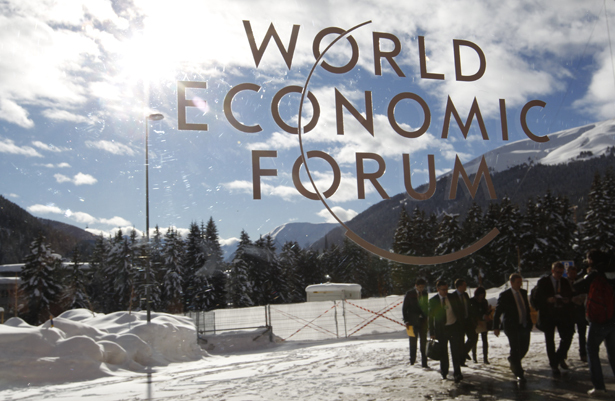 But debates on rising inequality are now de rigueur at the World Economic Forum. Strange as it may seem, debates on the dangers of rising income inequality are now de rigueur at the annual gathering of the global business elite at this snowbound Swiss mountain resort. During this year’s four-day meeting of the World Economic Forum, 2,600 corporate CEOs, investment bankers, fund managers and assorted social and intellectual entrepreneurs brainstormed and networked frantically during the day. Then, by night, they slithered from party to party in the old tuberculosis sanitariums—now five-star wellness hotels—along the ice-covered promenade. This is the Davos routine, unchanged through boom and bust, though this year the swankiest party was hosted by the Brazilian government and not a Wall Street bank. But ever since the onset of economic crisis, the astute Davos-goer’s agenda must also include at least one session on the implications of soaring income polarization in the twenty-first century. CEOs and private-equity fund managers—even some of the seventy Forbes billionaires attending—interrupted their search for distressed assets in the eurozone this year to attend lectures by grim-faced New York University economist and Davos regular Nouriel Roubini or Nobel Prize winner Joseph Stiglitz. The message: inequality is no longer just a social or ethical issue but an economic blight that will stymie recovery. “The superrich spend little of their incremental income, so we have a problem of aggregate demand, and that hurts the economy,” Roubini explained at a debate evocatively titled “The Seeds of Dystopia.” More than half the 1,200 investors, analysts and traders consulted in a Bloomberg poll published on the eve of the summit agreed that inequality damages economic growth. “Marx was right; capitalism creates obstacles to its own advancement,” said Roubini. The audience nodded in agreement and then headed off for sessions on new investment opportunities in “frontier markets” like Mongolia and Azerbaijan. Attempts to bring together the 1 percent and the 99 percent on the slopes of Thomas Mann’s Magic Mountain met another obstacle when a commando group from the igloo protest camp outside town tried to break up a public debate attended by British Labour leader Ed Miliband and Stephen Roach, Morgan Stanley’s global investment guru. Things got worse for the peacemakers back in the main conference center, which was protected by state-of-the-art security systems and police snipers on the roof. Salil Shetty, secretary general of Amnesty International, remarked before a packed audience of business leaders, televised live by the BBC, “A lot of the people who caused this crisis are walking around here now.” It was a statement of the obvious that fell like an avalanche on the Davos consensus builders, and not even the World Economic Forum’s latest young Global Shaper, Howard Buffett, son of Warren, Obama’s billionaire ally in the push for higher wealth taxes, could mend the bridges. But inequality would soon take a back seat to the latest gripping phase of the eurocrisis. First German Chancellor Angela Merkel, then the finance ministers from Germany, France and Spain, took the Davos stage, the latter cheered by CNBC financial reporter Maria Bartiromo. They tried desperately to persuade the forum that falling risk premiums on Italian and Spanish debt mark a turning point in the sovereign debt crisis. Bond traders were responding to the discipline enshrined in the new fiscal compact, they said. European Commission member Joaquín Almunia suggested at a late-night dinner with Spanish journalists that the markets were warming to the impending voluntary restructuring of Greek debt. Yet few at Davos seemed convinced. Most business leaders know that the real reason for falling interest rates on Spanish and Italian debt is the European Central Bank’s decision to pump nearly half a trillion euros into the banking system. The underlying problems remain unaddressed, most important the impact of simultaneous austerity policies, which are driving the Mediterranean countries into deep recession. Both Roubini and George Soros warned of a spiral of deepening recession and more debt. Greece has shown the way down; even if an agreement is reached on restructuring its 350 billion euro debt with voluntary bank involvement, most Davos participants were aware of the paradox: if the creditors’ “haircut” is voluntary, it will not be enough, and if it is forced on them, there will be serious contagion for Portuguese, Irish and Spanish debt. Even the bankers at Davos seemed more sensitive to the hardship in the periphery than European leaders. “Whatever the ECB does, the test will be if people in Greece, Portugal, Spain are prepared to put up with years of hardship,” said Gerard Lyons of the London-based Standard Chartered Bank. This is where inequality came back into the reckoning. In the decades before the crisis, Greece and Spain were among the handful of countries to have bucked the trend toward widening income disparity. Not now. Spain is in recession, and with 23 percent unemployed, the income gap has widened sharply since 2008. Now, after a minimum-wage freeze and 10 percent public sector pay cuts in Catalonia, the new government intends to pursue US-style labor market deregulation. The same is happening in Italy, Greece and Portugal. “They are going down the route to inequality we went down in the UK and as Nouriel says, the results are not economically sustainable,” said Philip Jennings, a union coordinator at UNI Global Union in Geneva who sat on the “Seeds of Dystopia” panel alongside Roubini. “This isn’t the Magic Mountain, it’s the Great Gatsby revisited,” he added. That’s Davos 2012. Everyone knows we’re on the road to the precipice, but no one seems able to turn around.